The free press and independent justice system makes the difference. Those can and do make a difference. No system is perfect, however. Chinese culture has an extensive heritage of moral philosophy. Despite that, it's still been shown that it's possible to overturn the social order there with massive consequences. The west certainly isn't above that sort of chaos. France and Germany, the largest economic powers of continental Europe, have that in their history. The US isn't entirely above this kind of chaos, either. The press in the west also follows a propaganda model. Justice systems in the west have been known to cooperate with the authorities in miscarriages of justice, particularly in wartime or when subject to near-wartime hysteria. When it comes down to it, there is always a struggle between good and evil in all times and places. The really tricky part of it is this: The worst evils disguise themselves as movements of good and justice. People and movements should be judged by their actions. Ask: Who is committing violence against whom? Who abets or tacitly accepts bad actions? Who is willing to call out their own side and their own tribe when they do wrong? The left/right political spectrum ceases to have meaning when you look at it that way. The Authoritarian/Anti-authoritarian spectrum and the tribalist/universalist spectrums hold much more value. Let me just jump on here to point anyone who might see my comment to some interesting, and highly relevant, material. And if you really want to educate yourself, do read the book . 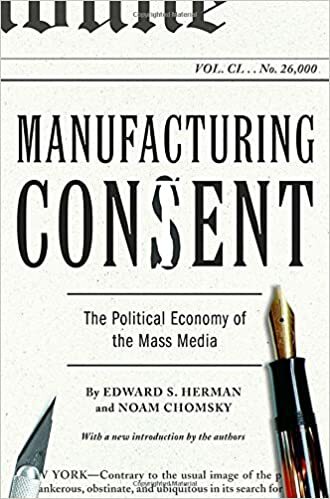 Chomsky (with Ed Herman) shows, in excruciating detail, just how propagandistic the US media are. >but it's another example of civil rights eroding. Civil rights don't exist anymore see this talk by national security advisor the upper classes of the world are afraid of the political awakening of the masses. These links will take a while to digest, but if you want to understand what's going on in the world, you owe it to yourself to become informed about the true state of the world. "Intended as an internal document. Good reading to understand the nature of rich democracies and the fact that the common people are not allowed to play a role."